Overall economic output in Alberta remains well below projections made before the late 2014 recession that battered the Alberta economy. While there are external factors influencing the provincial economy that are beyond government control, the provincial government can strengthen Alberta’s economic recovery through pro-growth policy initiatives. One such pro-growth initiative is deregulation. While there are well-known theoretical arguments for government regulation, there is also abundant evidence that government regulation often imposes substantial economic costs. Deregulation of sectors such as telecommunications and transportation has identified the substantial efficiency improvements and cost savings to consumers that can result from reducing or eliminating government red tape. The efficiency improvements go beyond reduced compliance costs and include gains from introducing new technology through increased capital investments and new business start-ups. In principle, all regulations for which the expected social costs exceed their expected social benefits should be eliminated. In practice, applying this test to all existing regulations would be extremely expensive and time-consuming. A more expeditious initiative would involve identifying “non-functional” regulations for elimination. Suggested streamlined criteria for eliminating red tape by identifying non-functional regulations include whether the regulation under consideration effectively addresses a legitimate economic or social problem. If it does not, it should be eliminated. Regulations should also be eliminated if other laws or regulations deal with the problems they address, or if they cannot be applied in a predictable and consistent manner. Regulations are also candidates for elimination if private market institutions, such as stronger property rights, can solve relevant problems more efficiently. The likelihood of successfully reducing red tape is enhanced by effective organization. The red tape reduction experiences of British Columbia and several other political jurisdictions highlight the importance of designating someone in senior government with a mandate to carry out the deregulation program, including overseeing the identification and elimination of non-functional regulations. 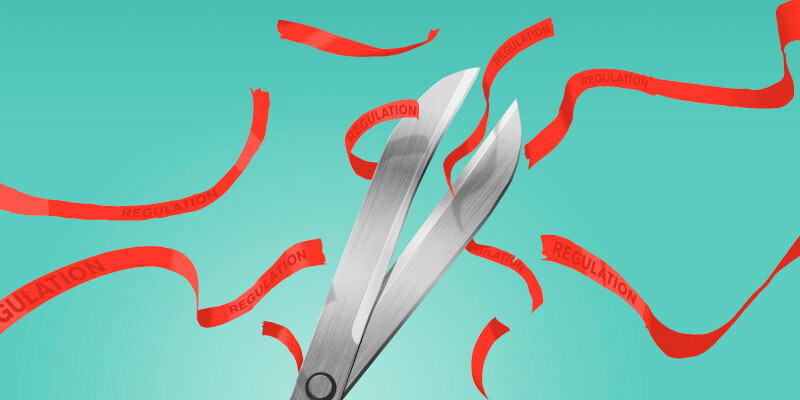 Another feature of successful red tape reduction initiatives involves tying the implementation of new regulations by relevant agencies to the elimination of some number of existing regulations following a prescribed rule, such as one that says no net costs should be created by new regulations. Obviously, decisions about retaining or eliminating specific regulations should be evidence-based. Regulatory agencies should solicit the advice of experts, but the experts should have no direct or indirect financial interest in the outcome of the agency’s evaluation. In addition, regulatory agencies should solicit opinions from stakeholders directly affected by specific regulations. Small businesses are important and usually knowledgeable stakeholders and their feedback should be regularly gathered to help identify non-functional regulations. To be sure, some prominent and likely the more expensive regulations may not be amenable to analysis using streamlined criteria. Specifically, some regulations may not fail a screening for non-functionality while still imposing substantial costs on society. A retrospective evaluation of such regulations requires a benefit-cost analysis. To the extent that applying streamlined retrospective evaluations saves resources, regulatory agencies should benefit from an improved capability to do careful evaluations of a regulation’s benefits and costs.